Hey Greyhawk fans and RPG players alike! I may not be at GenCon this year but I do have something exciting to show everybody! 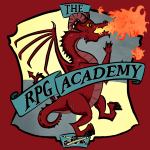 I recently did a podcast interview for The RPG Academy's "Show & Tell" feature. You can now listen to me ramble on about Greyhawk, Canonfire, Greyhawkery, art and other things. Enjoy! Thank you to the host Michael and the rest of the RPG Academy network. Check out their site and look around!